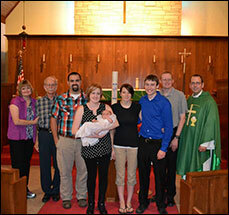 By Baptism: The Sacrament of Holy Baptism is for all people infants, children, or adults. ( ; ; ; ) Children who have received the Sacrament of Holy Baptism at Zion Lutheran Church are considered Baptized Members of Zion who are under the spiritual care of the Pastor. Adults who are not yet Baptized can contact the church office by email or by calling 316.283.1441 and enroll in Adult Information Class and receive the Sacrament of Holy Baptism. By Confirmation: Baptized members of Zion can go through a three year period of catechetical instruction in the Christian faith beginning in sixth grade. At the end of this three year period, the youth may choose to undergo The Rite of Confirmation whereby they confess for themselves what their parents confessed for them at the time of their baptism. By Profession of Faith: Adults who are interested in becoming a member of Zion may enroll in our Adult Instruction Class where they are taught what LCMS Lutherans believe, teach, and confess. If you come from a non-LCMS Lutheran congregation, this course will serve as “refresher” in Lutheran doctrine, as well as clarify the differences between LCMS and other Lutheran denominations. Enrolling in our Adult Instruction Class is easy, simply contact the church office by email or by calling 316.283.1441. By Letter of Transfer: If you are currently a member of another LCMS congregation you may request that your membership be transferred from your former LCMS Congregation to Zion. To do this, please contact your former congregation and ask for “A Letter of Transfer” to Zion Lutheran Church, Newton, KS 67114.